I'm Unschooled. Yes, I Can Write. : What About College? Hello, my name is Natalia Radic (this is my boyfriend's email address, I do not have a yahoo account). I am a junior studying journalism at Ohio University's Scripps School of Journalism. 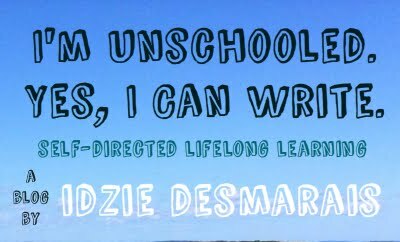 I have always been interested in the concept of unschooling and would like to explore the topic for a class assignment. I am looking for any unschoolers that are open to sharing their experiences with me for the purposes of my article. I pass no judgement and will handle your personal and private information with sensitivity. My objective is to inform readers about unschooling and refute any negative stereotypes, especially those portrayed in the well-known Good Morning America segment that passed bias to viewers. If you'd like to be interviewed, my phone number is 440)665-4145 or you may email me at nr405710@ohio.edu. Hi Idzie! I m pleased to see that you know what you want-and that you are clear enough in your head to refuse the obvious path if it doesn't suit you at present. My 17 year old is off to uni this fall- because that is where she wants to be.My 15 year old says 'no uni for me. I want to be an actor." My 14 year old wants to 'get on with it' and plans to travel asap. The thing is to follow the path with heart. Yes thank you thank you thank you! Why is "what about college" the question people keep asking. College today seems like the only goal people have for their children.It comes second to happiness which I believe should be every parents dream for their children. Whatever happiness means... I was put through school for 12 years, and I have decided to unschool myself for college. I created a blog dedicated to the things I'm doing for my educational college age. I'd be happy if you checked it out. Izie - so nice to meet you! I think that you are very prudent to carefully weigh the ROI on a college education and you are not alone; you are actually in very good company. Just recently watched a 2 day "Personal MBA" class on creativeLIVE with Josh Kaufman, who also opted not to go to graduate school. Reading + Mentors + ACTION is an amazing formula to create a life you love and contribute to the greater community. ps. the creativeLIVE classes are free is you watch them live. pps. would be better if your donate button opened a new page on a seperate tab or window - it was a bit if effort back to your blog. Please do visit my blog to find out what places education took me to. Hello! I am a mother of three who aren't even old enough for a typical public school yet, but I cant help but wonder what will happen if they decide to go to college. We live in Indiana in the U.S. near a lot of universities, and when I look on their websites for information about how homeschool students go about applying and what information they need to apply for the university, it says even homeschoolers must provide transcripts, their coursework and grades. Obviously an unschooler does not have these things, so I'm not sure how they would go about applying if they didn't have all the information they needed. Does that mean they couldn't go to college without a transcript with all the information of their schooling in it?? Do you even know the answer to these questions? Lol! I'm desperate for more information. Very interesting and timely post. My 16.5y.o., unschooled son is passionate about a field that doesn't require a college degree. He has taken community college classes, and sees this route (2 year degree leading to a 4 year degree) as off-track for his goals. I'm coming around to his point of view. Agree about the inaccessibility of academia. It wasn't like that in the 80s when I went to college.